This ceramic pie dish is perfect for baking traditional apple, pumpkin, and key lime pies. Our American-made stoneware event distributes heat to create a crispy, caramelized crust. 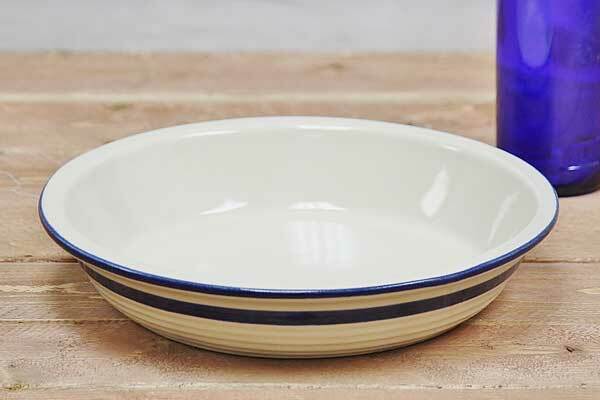 These ceramic pie pans are microwave, oven, refrigerator, freezer, and dishwasher safe, however, make sure your stoneware has reached room temperature before heating or freezing, as extreme temperature changes may cause your product to crack. None of our stoneware products contain lead or harmful chemicals. We also sell a ceramic loaf pan and stoneware casserole dish with lid for all your baking needs.